On the 28th of February, we were very lucky to have Peter Burton come along to talk to us about the Aeronautical History of Oxfordshire. It was a lively meeting with a lot of discussions. We learnt that the Automobile Association had in the early days of flight produced a book showing all the sites where an aircraft could land which was updated monthly. This was important as some of the landing strips were just fields and occasionally had livestock in them! Oxfordshire’s pioneers of flight were innovative and very courageous. James Sadler of Oxford was the father of British Aeronautics and in 1811 broke the record for speed in a balloon which was roundabout 85mph quite impressive. 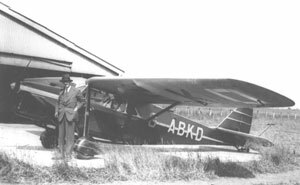 We were told about the two early aviation companies that although at the time were outside Oxfordshire their airfields were within Oxfordshire. Aerial Photography was also used in the early days of flight by one Major George Allen who not only used a camera in his Puss Moth “Maid of the Mist” ABKD but he also checked the ground after getting the Ariel images developed to see what he could match up. So flight helped out in the early days of archaeology also. It was a very interesting evening and one that I think we all very much enjoyed and would have loved to have heard more.